Want to hear the author read this post aloud? 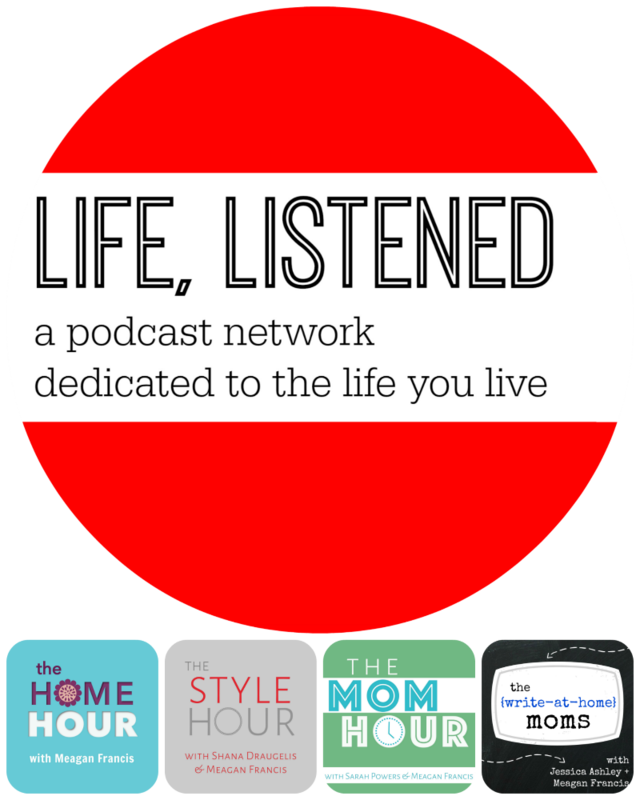 Check it out on The Mom Hour podcast here! ‘Tis the season, moms – to take sides on any number of holiday-themed debates du jour: To Elf or not to Elf? Fake tree or real? Listen to Christmas music before Thanksgiving or no way? Black Friday or Cyber Monday or Small Business Saturday? Holiday baking from scratch or from a mix? And the big one: Is Santa Claus a treasured part of childhood Christmas or a commercial lie that threatens the holiness of the season and may damage our kids? I personally make a terrible soldier in any mommy war (or even lighthearted debate), because I can almost always see both sides. We get a real tree but I can totally see the upsides to a fake. I don’t play Christmas music in the house until after Thanksgiving but I’ll bop along merrily if it’s on in the store. And while Santa is beloved and believed in by my children, I can relate to parents who are uncomfortable perpetuating a story that involves a pretty creative interpretation of the truth, or who resent the pressure to keep up with a hyper-commercialized 21st century version of the old St. Nicholas tale. My feelings about the Santa debate are heavily influenced by my 4-year-old’s personality. She’s cautious, naturally skeptical, highly inquisitive and extremely literal. When you combine that with my own tendency to intellectualize, to explain, and to reason my way out of life’s big questions, we make a pretty unromantic pair. Last year, at three, she asked me point-blank whether the Santa at the mall was “just a normal guy dressed up in a costume,” and I answered her, unequivocally, that in fact he was. She had recently been through a typical bout of Halloween-inspired anxiety about costumed characters and imaginary villains and we’d spent many weeks assuring her that vampires and witches were totally pretend. It just didn’t feel right to turn around and swear up and down that the dude in the red suit was the real deal. On the other hand, I want her to believe. Oh, do I want her to believe. I’m not so hung up on telling the truth that I can’t allow for a little storytelling and magic-making as part of Christmas parenting. I have deliciously fond and very real memories of the Santa I believed in as a child, and I don’t for a second regret that my parents stretched the truth a little to give me that experience. In the end I come down on the side of Christmas magic. I believe in it, I’ve witnessed its awesome power over the young and not-so-young alike, and I desperately want to extend its stay in my home. So as I fumble my way through my fifth Christmas as a mom, I continue to seek that balance between my personal need to be as truthful with my kids in December as I am the rest of the year and my desire to give them a Santa experience to enjoy and remember. It’s easy to feel like we’re supposed to have a clear-cut answer for every question tossed up from the back seat of the car. But if you have preschoolers you know that you’d need Ph.D.’s in multiple subjects to keep up with the natural curiosity of a 4-year-old. My personal approach has always been to own up when I don’t know the answer to something (to which their reply is usually, “let’s ask Daddy” or – even better – “Mom, can you ask Siri?”). I like to imagine… This is one of my favorite ways to answer Santa questions. The truth is, I have such a vivid memory of how I imagined Santa as a child that I can paint that mental picture for my kids with total truth and incredible detail. Isn’t it magical? Mysterious? Amazing? Yes, it is. And it’s okay not to understand it all. Answering Santa questions this way makes it easier on me in a couple of ways. One, it feels truthful and that just sits better with me. These are answers I can stand behind, and that can’t be proven wrong by preschoolers comparing notes on the playground. And two, it’s a lot easier than remembering an elaborate explanation about how elves make the exact same toys we’ve seen in Target – which, in the end, isn’t probably something they care that much about in the first place. Santa may not be real, but the place that books and stories take us is. I know that the Santa of my mind’s eye looks most like the one in the 1970’s paperback version of The Night Before Christmas. That close-up illustration of him wreathed in pipe smoke? That’s my personal mental-Santa-image – and it’s totally real. I’ve found that the more books we read that incorporate some element of the Santa story, the more options our collective imaginations have to experience the narrative. One of our current favorites is The Christmas Magic, in which there is no Mrs. Claus and nary an elf in sight, and – most disturbing to my 2-year-old at first – Santa wears a dark blue coat and Merlin-esque hat. But oh, the illustrations and the language and the sweet details on every page – it’s hard not to believe that this is just how it is at the North Pole. Kids are used to being totally transported by stories – they are real because the experience of reading them is real. Stories require a willing suspension of disbelief, something children are uniquely capable of. And I find that the more we read (and re-read) our favorite Santa stories, the more examples of possibility we have to draw on when we get into a discussion about the magic and mystery of Christmas. 21st century believers get to choose from so many different ways to “do Santa.” They can sit on his lap at the mall. They can have an Elf. They can track him online. They can mail him (or email him, or text him) their wish list. They can have breakfast with him at a fancy hotel, or see his workshop in person after a Polar Express-inspired train ride (that’s a super popular one where I live). I understand the desire to bring Santa to life and make him a tangible and thrilling part of the season; I just know that for my kids, a little goes a long way. The last two years we have done the mall Santa experience on a weekday morning when no one else was around. No line, no big deal if the toddler balked at the last minute, and no rush for the 4-year-old to explain her heart’s desire to the big man. It was commercial, yes (and I forked over $22.50 for the photo you see below), but it was probably the only thing like that that we’ll do this year. I guess I feel like just because these options are available doesn’t mean we have to do them ALL. Even if you could afford to opt in to every Santa-related experience your town has to offer, it seems to me that the more of these types of things we do the more probing questions we get from our kids (and the less there is left to the imagination). Choosing carefully which of these activities we do is another way I think we preserve a little bit of the mystery of the Santa story. As our family grows and if the kids want to, maybe we’ll incorporate a few more ways to experience Santa throughout the season, but my hope is that believing doesn’t always require seeing – and that, in fact, the less we see firsthand the more deeply they’ll believe. Here’s my real secret to keeping the Santa story alive in our house without feeling like I’m complicit in a big, fat, jolly red lie: I don’t really bring it – or him – up at all. I answer their questions in the ways I talked about earlier. I’ll read any story they ask me to. And, when it makes sense and their desire leads us to, we’ll do something fun like sit on his lap at the mall. But I don’t initiate – I don’t remind them that he’s watching their behavior, I don’t prompt them to come up with a list or write a letter, and I have thus far kept our home Elf-free. Sound grinchy and paranoid? Maybe. But it works for me. By following their lead, I get to see a vision of Santa Claus develop over the course of the season as just one magical piece of a Christmas experience that also includes the story of a miraculous birth, and a festival of lights celebrated by many of our friends. It’s not like I’m censoring – I love a little Santa in our lives this time of year – I just don’t think it’s my job to bring him up at every opportunity, defend every detail of his habits and whereabouts, and participate in every chance to sit on his lap for $40 a pop. And in releasing myself from being the steward of Santa magic, I actually think I’m leaving him open to more imagination, interpretation and ultimately more enjoyment for my kids. When the day comes for my oldest to know a more adult version of the truth, I hope this approach will make that transition easier. I hope the knowledge that Christmas is a time of miracles – magic and mystery and things we cannot hope to fully understand – softens whatever blow the news brings with it and allows her to continue to sense the season’s mysteries and help make them real for her younger siblings. I hope she’ll see that there is truth in the Santa story – the truth of wishing and hoping, of secrets and surprises, of giving and receiving – and that no matter who really bought and wrapped the presents under the Christmas tree, the love that brought them there is undeniably real. Do you have Santa skeptics in your house? How do you answer their questions and maintain the mystery? 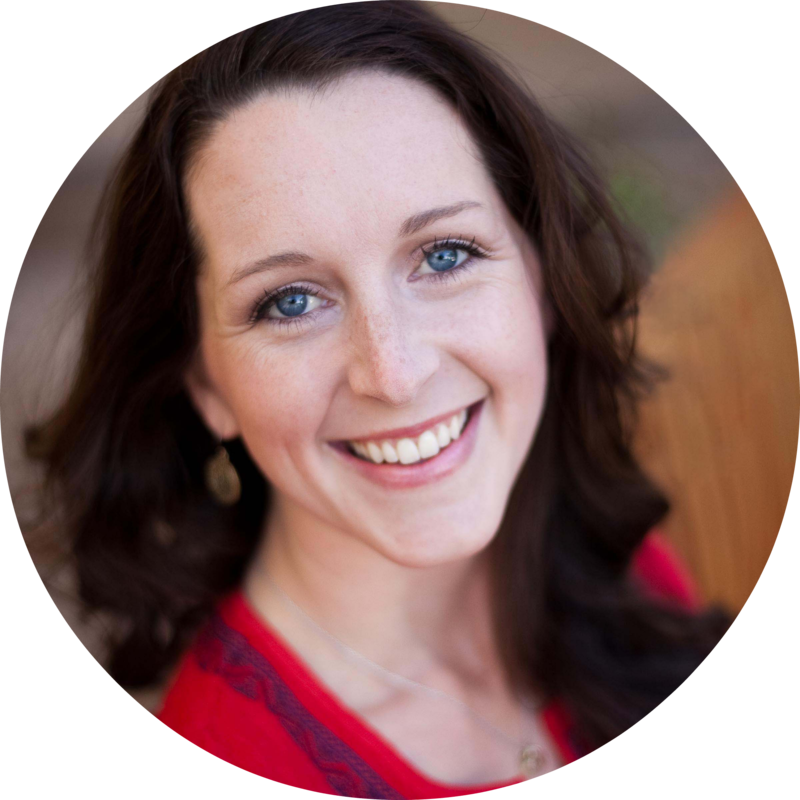 Sarah Powers lives, writes, and wrangles three young children in Southern California. She also co-hosts The Mom Hour podcast with Meagan Francis. 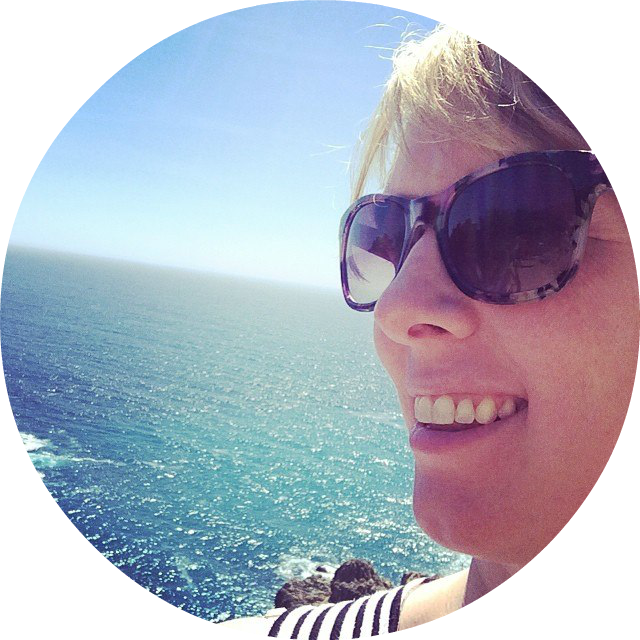 Find more of Sarah's work by following her on Twitter and Instagram. It seems to me that this might be one way to approach the ubiquity of mall Santas: yes, that’s just a regular guy in a suit, but he’s doing it because he believes that Santa makes people happy, and he wants to help with that. Oooh, thanks! I’ll have to check that out. And I love that approach to the mall Santa question. Thanks! My son turned two at the end of August, and so this is the first year he’s even really aware of Santa, and he is ALL IN. He doesn’t ask questions yet, but I plan to hang on to these tips for when he does – I think that sense of magic is so lovely and we want to keep it around as long as we can. Right now, though, it’s easy – we saw a white-haired and bearded man who was sporting a Santa hat at the post office parking lot two weeks ago, and I’m still hearing it about it. For him, Santa is everywhere now! I appreciate the way you make the magic without lying….that was a big hang up for me. We’ve choosen to talk a lot about St. Nick and why people like to imagine there is a Santa. It has been a great way for us to talk about the importance of giving to others during Christmas. The funny thing is that my 5 year old informed me the other day that he believes in Santa! 🙂 It was so cute, as he is normally a bit sceptical of things. Kara, I have totally had the same experience with my skeptic – just when I think she’s not buying into it, she totally surprises me. I love your approach. Thanks for reading! I’m a lot like you, Sarah – I am very ambiguous, answer a lot of questions with questions of my own and in general limit the “santa” exposure so that the mystery just feels a bit more mysterious (and it’s less of a shocker when they figure it out.) I don’t think we have to takea hard line on this one way or the other – it’s very possible to let the myth live on without enforcing it so strongly that we feel guilty when they finally figure it out. Great post! Yes, my older kids love helping make things magical for the younger ones! My middle son just turned 9 and I’m guessing this is his last Christmas believing – he really WANTS to believe, but has been kinda figuring it out slowly over the last two years. I was very similar at his age. My oldest (15) is a skeptic and an analytical-minded kid; he “helped” my 13 year old figure it out around the age of 8 or 9 – not by being a naysayer, I don’t think, but just because he stopped believing and it was evident. None of them have ever been angry about it, though I think some kids are just naturally a bit more disappointed than others. I figure there are a lot of disappointments as you leave childhood behind – that’s a big part of the process of separating yourself from those beliefs, you know? My guess is that once William (my 9 year old) has it figured out, Owen (7) won’t be long after and then the four of them can concentrate their efforts on bringing the magic to their little sister. I’m hoping we still have a few years of that magic left with her, but I’m not making a huge deal out of it either way. This has been a big dilemma for me. Ultimately, my husband and I decided to downplay Santa. We’re afraid that if my son discovered that we had embellished the truth about Santa, he might question other things we’ve told him (particularly religious concepts). He is currently almost 5, and starting to ask if Santa is going to leave him presents on Christmas. I’ve told him about St. Nicholas, and that Santa Claus is a nickname for St. Nicholas. I told him that now that St. Nicholas is in Heaven, he needs helpers here on earth to give out Christmas presents for him. I told him that sometimes we call St. Nicholas’ helpers “Santa”, and that some of his helpers wear Santa costumes and some don’t. He’s still kind of confused about the whole thing, which is probably good because I’m hoping it will prevent him from telling his friends at preschool that Santa is not real. But when he’s older and puts it all together, he’ll know that we never misled him (and I’m not implying that parents who do the Santa thing are misleading their kids; I’m just doing this as an extra precaution to prevent him from having that impression). In the meantime, we still read Santa stories and pretend, and he still gets some of the excitement of Santa plus plenty of other sources of Christmas excitement. Claire, I think you sort of hit the nail on the head, which is that we get to sort of craft our own version of the Santa story – in a way that feels consistent with our family values. It doesn’t mean other families’ Santa traditions are wrong – just different. Sounds like you’ve thought a lot about this with your son. Love it. Oh the irony, there is NO difference between religion and the santa myth. Why are you picking and chose which lies you tell your child? Daniel, not that your ignorant comment really warrants a reply, but I can’t help myself: If you don’t have any religious beliefs to share with your kids, fine. But that doesn’t mean that those of us who do are lying to our kids, or that our religious beliefs are the same as a magical childhood legend. I grew up with no “magic” re: the Big Elf. My own mother is a person with NO ability to pretend, and she considered Santa to be a big lie. It didn’t hurt me in the long run, but I DID make sure to keep the magic alive for my kids as long as possible. And as my older kids figured it all out, they were eager to be “in the know” as they perpetuated the magic for their younger siblings. My tactics included the “what do you think?” answer. I also told them that Santa only visits kids that believe in him, and if you stop believing your mom and dad have to do it. One year I bought a large sleigh bell, strung it on a strip of leather, and laid it on the front walk as if it had rolled off the roof. The youngest child, who that year was on the verge of not believing, was sent out to retrieve the paper Christmas morning and was thrilled to find such evidence on our front walk. To protect our budget, and their belief in case our budget could not keep up with their requests, Santa ONLY fills stockings in our house, and leaves under the tree two family presents: one game and one video. Certainly there are at least 2 schools of thought re: Santa vs. religion. My own feeling is that God is a concept that most adults can’t fully comprehend, much less expect a small child to. I think that Santa brings the whole concept of an all-knowing, somewhat magical being into a scale that is more “real” for a young child and that it lays a foundation for a belief in the unseen. So much of how far you carry the fantasy depends on the personality of the child (like my mom who was convinced her parents LIED to her). I see no harm in beginning the game, and by the time a child is old enough to remember it from year to year, probably around 4, you should have figured out whether or not it’s a wise choice for that particular child. Oh, Wendy, this is fascinating. I love how so many of our parenting choices are either very similar to how we were raised or, in this case for you, a total reaction in the opposite direction. I love that your older kids help keep the magic alive for the younger siblings, and as I commented above to Meagan, that’s something I remember really fondly about being the oldest in our family, too. And YES, each child’s personality makes such a difference – many of my friends with kids the same age as my oldest (4.5) haven’t even had to deal with the questions that we’ve dealt with the last two years. Thanks for reading! This brings tears to my eyes. It’s such a blessing to partake in the magic, wonder and joy of Christmas through the eyes of the littlest people in the world. They are truly our teachers. I really enjoyed your approach to Santa and am probably pretty close to how you would have handled it. My son doesn’t know Santa; we don’t do Santa gifts or hype him up. If he sees a Santa and asks about him, we’ll tell him that’s Santa but leave it at that. If he starts asking more questions, I would probably follow the open-ended questions you proposed. It’s very similar to any other imaginary play he does. Just this morning, he insisted that the pile of blankets he put together was my new bed and that I was to lie down on it. I could have easily contradicted him and said, “Well actually that’s a pile of blankets. A bed has a mattress and tends to be bigger.” But no; instead I follow his lead and play along with him. He probably knows this isn’t a bed, but then where is the fun of imagination? Perhaps, it’s just my take, but to me “Santa” is real. Santa is bringing another’s person’s wishes to life, secretly, giving something special to another WITHOUT that person knowing who it is from. When children are young, they are not the givers–it’s not within them yet. Our children receive one gift from Santa that they have asked for–it’s the only time of the year they have a say in the gift. (My girls don’t have a say in what their birthday gifts are.) To see the joy on their face is so neat, but what I love the most is that their world opens up to the fact that we as people care for each other and help others. Santa has reached out to them and given them their wish–not because they were good or bad, but because of Love. This is the magic of Santa, of Christmas–that we will do something to benefit another person, but we do it secretly without any expectation of receiving anything in return. In a way, even giving Santa gifts to our children do this, since I don’t get the same personal response from my kids when they get a Santa gift. Santa is the coolest person in the world in their book–not mom and dad. When my girls get older, it will be their turn to become Santa. This is something they need to do by spending their money to help somebody else in fulfilling that person’s wish. They can’t be Santa if they are merely a courier of my gifts to somebody else. 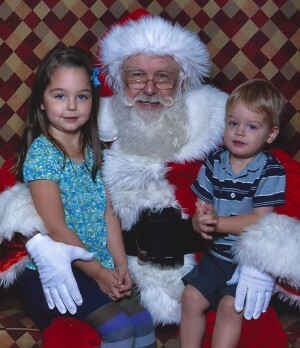 We may soon start transitioning my oldest daughter to becoming Santa. I picked out a lovely silver bell with her birth year, which will be her “Santa bell” when she is officially turned into a Santa. And then she must go and grant another child’s wish through Toys for Tots, Angel Tree, Giving Tree, etc. I like your suggestions as to how not to lie about Santa. I think kids get enough ideas as to how Santa does what he does from movies, books, etc. We don’t need to add to it. Santa has reached out to them and given them their wish–not because they were good or bad, but because of Love. This is the magic of Santa, of Christmas–that we will do something to benefit another person, but we do it secretly without any expectation of receiving anything in return. I can see how much thought and intention you’ve given this, and I admire your approach. Thanks for sharing! Love your blogs and as usual I ttly agree with your approach! Another catch phrase I use when answering my 4 year old’s questions… “some people believe…” So far she hasn’t asked me specifically what I believe. But when she does I’ll stay true to the sentiment of keeping the magic alive without blatantly lying. I love how everyone has their own way of handling it. We finally told our 12 year old this year because I didn’t want him to feel silly around friends if it happened to come up. He wasn’t mad, but he did tell me later that I could have waited another year. My 10 year old figured it out not too long after. They are both very much enjoying helping keep the magic alive for our two little girls, and being “in the know”. I never believed in Santa as a kid, and while it wasn’t a big deal, I kinda felt like I missed out on something. I wanted my kids to have the chance to believe for as long as they wanted to. We have always handled any fantasy thing by letting them know that it is totally ok to pretend and imagine, but we have reminded them often of what is real and what is pretend. They don’t seem to have any problem distinguishing now. Santa fulfills the fun part of Christmas for us, and we still focus on the sacred part plenty because that is important to us. They both seem to fit just fine. I think your ideas for not lying are great. I’ll probably use some of them with my younger two, when they are old enough to ask. We don’t do Santa in our house. Both my husband and I come from families that didn’t, mostly for religious reasons. My parents are from a Mennonite background and my husband’s leaned more towards the anti-lying school of thought. When it came to what to tell our kids I could have gone either way but my husband is very strongly anti-Santa and I respect that. For me, it’s more that our family traditions don’t include Santa and to be perfectly honest, I’m not even sure how one goes about introducing Santa to kids. My Christmases never looked like that. While I certainly don’t have a problem with other parents perpetuating the Santa thing (and trust me, we’ve talked to our oldest about not going around telling his friends Santa isn’t real!) I do have a BIG problem with the assumption that Santa is the only way to experience the magic of Christmas. Yes, there were times growing up I wished I believed Santa but if I look back objectively it was really more that I wanted a more celebratory atmosphere in our home. Again, my parents grew up in very conservative Christian households and my paternal grandmother dying on December 23 the year my father was 16 so Christmas was a difficult time for him. For my own children I am able to create a celebratory and magically experience during the Christmas season without teaching them that fat comes down the chimney with presents. Or buying a creepy Elf. 🙂 It’s not hard, even as a non-Christian. 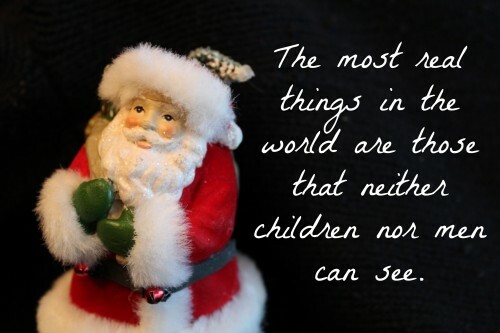 And I truly don’t think our kids are missing anything by not believing in Santa. We don’t make big deal about it at all and our kids spend plenty of time watching Christmas specials, reading stories, and pretending about Santa. I know how you feel, Beth. My extended family gets on my case about it, and it is annoying, because I don’t criticize people who handle it differently than we do (and I’m being very careful to avoid a situation where my son might go around telling other kids that Santa isn’t real). I don’t feel like my son is missing out on anything. He loves Christmas. He is so excited when we decorate, bake, do crafts, make gifts for others, etc. In fact, he gets just as excited about giving as he does about receiving presents. He loves to make ornaments and give them as gifts, for example. He doesn’t watch TV (another thing that people get on our case about), and I think because of his lack of exposure to commercials, he doesn’t even know what to say when people ask him what he wants for Christmas. Of course he knows he will get presents, but he doesn’t spend time wondering what they will be or dreaming of what to ask for. That just isn’t a big part of the focus for us. Anyway, as I said, I know how you feel, and I appreciate that on this thread there hasn’t been judgment from people who handle the situation differently. Yes, one of the reasons I like this blog! :). And what we try to teach our kids. Different people have different opinions and rules. It doesn’t mean one is right and the other wrong. Let’s hope that holds up in middle school, eh? Oh Beth, on the contrary, I think the most magical parts of Christmas are way beyond Santa – so I totally agree with you that it’s possible to celebrate the season without him. I can really relate to parents who opt out of the Santa story altogether, even though that’s not what we’ve chosen for our family (kinda like I can totally appreciate the choice to homeschool even though I didn’t make that choice myself). We are two of a kind! Santa is ‘alive’ in the same kind of way at our house. Thanks for sharing! Hi Sarah! I know this article is a few years old, but I’m wondering how you handled gifts. Did your kids ever get gifts from Santa? That’s where my hang up is. If I did what you did above but still gave gifts from Santa, I would feel like I am participating in a lie. It’s no longer child-led but parent-led in this respect. What are your thoughts on that? My husband and I are at a crossroads and need to start making decisions this year on how we want to handle Santa. Our daughter is 3, and suddenly knows and believes Santa is real all without any information or prompting from us. Her biggest gift at the age of 3 is imagination, and I LOVE it! So I don’t want to take that magic from her at Christmas, but I also want to always feel like everything I do/say is honest. She is so much fun and because of her ability to imagine wild and crazy, wonderful things, I know sharing the magic of Christmas is going to be a blast. But I also know how deeply she believes, and I also don’t want to destroy that later when she begins to understand who Santa really is.